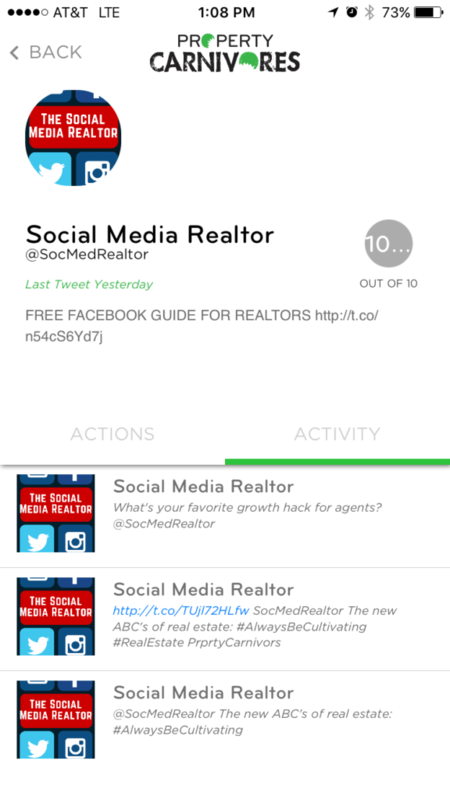 Social media marketing can be much easier than most agents realize. Gamification has merit in new business development. A strong social media marketing plan can earn more prospects per dollar spent than portal advertising. 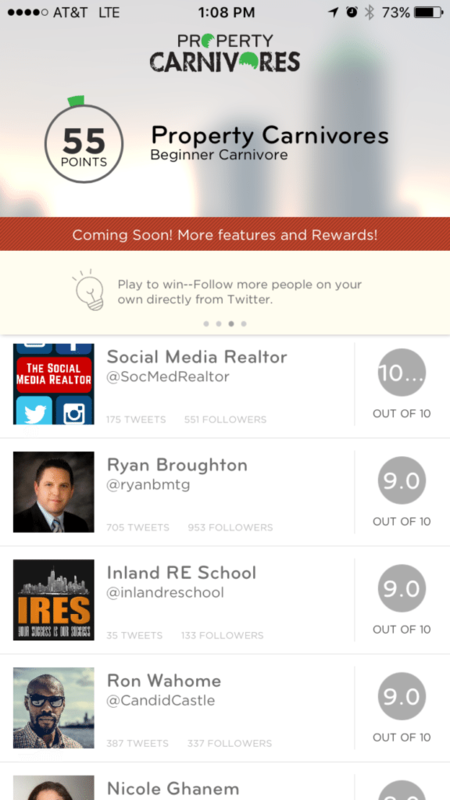 Property Carnivore is a social media prospecting “game” for real estate agents. It’s very easy to get started; you just need a Twitter account. Custom, pre-written content makes responses timely. It creates structure around your social media plan, so it’s good for those who don’t know where to start. Only for iPhone currently. Like all social media efforts, you need to remain committed for it to be effective. The software has tools to keep you active. “Gamify” is a word that made this rather dubious list of mine. I didn’t really explain why. I find it more misused than over-used. And I’m open to correction. So I demoed Property Carnivores, which gamifies (shudder) real estate prospecting. What adds salt to the proverbial wound is that I liked what I saw. Using your current list of Twitter contacts, Property Carnivores awards you points for engaging with your followers. A favorite gets you some points, a typed response or retweet gets you more points. 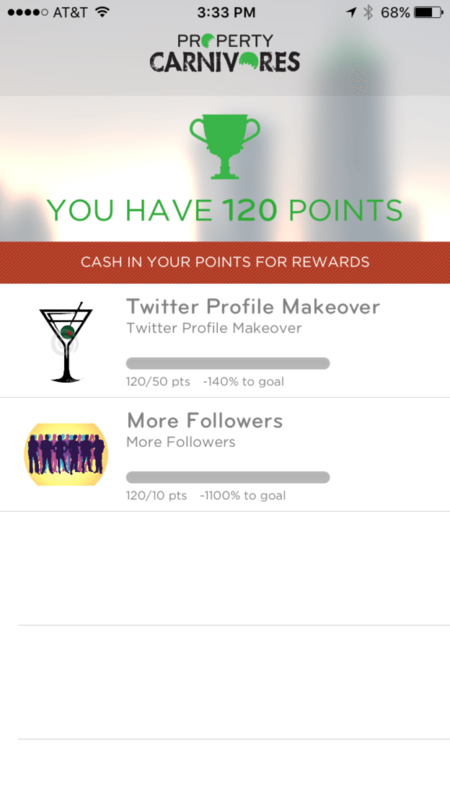 The point system is weighted to favor manual interactions. What adds salt to the proverbial wound is that I like what I saw. Agents can rank themselves against other agents as they go, so the spirit of competition is ever-present. Who doesn’t want to beat that smug agent from Sotheby’s with the GAP-ad-ready family bench banner? Your points relate to your level of online influence among your market, the very point of using social media for business. The software also curates related content for you to share, finding for you a range of local, lifestyle and business news and stories. Agents on the move (aren’t you all?) will benefit from the 25 pre-written responses Property Carnivores has ready for you. Or, just type your own for a few more points. 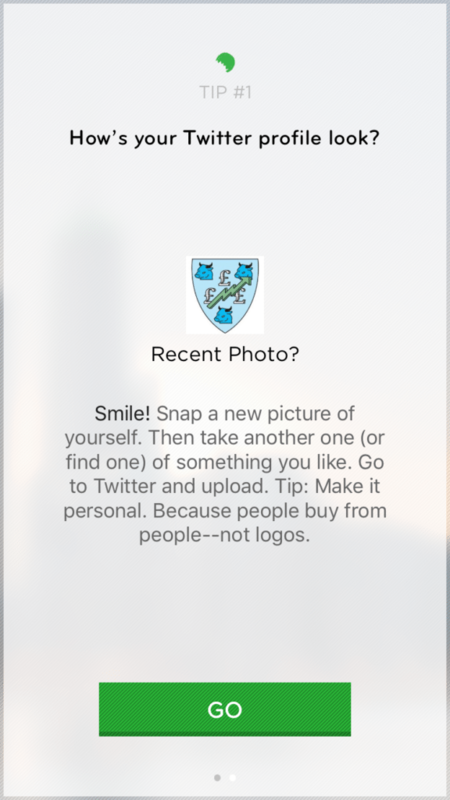 The app is nearing its beta launch, which I was informed would happen “sometime” this week on Apple’s App store. It’s currently in the store’s Test Flight stage, a requirement of the fruit company. Jeff Walker of Property Carnivores told me that anecdotal evidence gathered in early testing shows that after 100 points, users can expect 3 percent to 5 percent of their interactions to become sound leads. That’s pretty good when you factor in zero hard costs. The app is currently free. Again, that conversion is so far anecdotal, but completely reasonable. How you rank among your competitors is based on your efforts. Zillow claims to convert 1 percent to 3 percent of your leads per $100 spent. How you rank among your competitors is based on your efforts, your willingness to interact on social media. It’s not based on your advertising budget. Far too many agents dive in to the social media pool with no real tactic for how to survive once in the deep end. Property Carnivores adds structure around a social media plan, it helps you with content and keeps you motivated to respond, create and track. The company is working on future collaborations with Instagram and Yelp. As Property Carnivores enters its beta stage soon, early adopters can expect to have a strong voice in its evolution.